The 21st century has seen the proliferation of multiple information and communication technologies (ICTs) that are constantly changing and increasing in scale and capacity. Society is still adapting to this rapid change, and may never fully come to grasp the power of the exponential growth of technology. However, policymakers must attempt to comprehend these new technologies if they are to be harnessed in order to help policies achieve their goals. Technology can be a hinderance in the policy world if the effects of ICT usage is not studied and correctly inserted into the policymaking process. The process under examination in this paper is that of American foreign policy. This piece of the United States government will be looked at from the perspective of increasing Internet penetration. How does increased usage of the Internet affect the goals of American foreign policy? This question is critical as policymakers attempt to use ICTs in greater amounts. Meeting its foreign policy objectives through evolving technology is a new paradigm for the United States to consider as it adds an element of constant change that has not always been prevalent in the traditional activities of diplomacy. As it stands, those that lead the organizations that represent the United States abroad did not grow up during the information revolution and thus have a different perspective on how ICTs, and especially the Internet, can be used to assist them in their policy objectives. Thus, it is important for those who are familiar with the effects of ICT penetration to collaborate with those that make policy in order to create a harmonious strategy that takes into account present day paradigms of technology. The paper will discuss the how the United States seeks to bring freedom and democracy through the medium of the Internet. This is an important distinction as it sets this paper apart from those that engage in discussion about the freedom of the Internet. As the new mediums of communication become more widespread, the governments of the world will increasingly use these channels as their primary way of achieving policy objectives abroad and domestically. This paper sets out to explore the effects of the Internet in a context that would be relevant to American foreign policymakers. American foreign policy will be broadly discussed to ascertain the goals and objectives it seeks to achieve, and then how the Internet and ICTs play a role in American foreign policy. The effects of the Internet will be framed in a socio-economic discourse, with an concentration on how governmental affairs and regime types are impacted by the Internet. Finally, a framework for using the Internet in American foreign policy to achieve its stated goals will be constructed and some of the Internet freedom strategies used by the United States will be examined to determine their effectiveness. These technologies have fueled people-powered political movements, made it possible to shine a spotlight on human rights abuses nearly instantaneously, and increased avenues for free speech and unrestricted communication around the world. We support the dissemination and use of these technologies to facilitate freedom of expression, expand access to information, increase governmental transparency and accountability, and counter restrictions on their use. The ICT focused section ends by stating that the United States will then use the new technologies to communicate the messages of the NSS as a whole to the world. In what should be a symbolic signal that the United States is increasingly interested in cyberspace, a policy paper from the White House titled International Strategy for Cyberspace was published in early 2011. The reasoning given for the first ever American strategy dedicated to the technology of the Internet is that cyberspace is becoming a significant driver of economic growth and political empowerment. The rising importance of digital networks to nations’ societies as well as to international exchange of goods and information is why the United States is publicizing their stance on cyberspace to the world. The policy paper echoes themes in the NSS, and presents a more nuanced approach to how the entire government of the United States is affected by the Internet. There are policies for the economy, security, military, and Internet governance included in the document. The belief in the potential of this digital network for bettering society is the backbone of the policy as a whole and will be represented in the actions taken by the US foreign policy institutions that are examined below. The election of Barack Obama, and the appointment of Hillary Clinton as Secretary of State, saw a notable change in American diplomacy take place, especially in the usage of technology. The face of this change in the diplomatic field has been Alec Ross, who is the first senior advisor for innovation to the secretary of state. An advisor from the Obama Presidential Campaign, where he focused heavily on engagement through technology and social media, Ross has a track record of using technology for development in the private sector as well. His role under Secretary Clinton has been to blend the role of technology and diplomacy and shape the digital diplomacy policy of the State Department (Kang). Ross’s efforts have been to integrate technological tools with the classic functions of diplomats. The shift in 21st century statecraft has changed traditional strategy and style in order “to amplify traditional diplomatic efforts, develop tech-based policy solutions and encourage cyberactivism” (Lichtenstein). This statecraft agenda on the part of the State Department “aims to harness communications technology and information networks to address the U.S.’s grand challenges on the international stage: aiding democratic movements, providing disaster relief and alleviating poverty.” (Gustin). This has also led to the United States becoming more engaged with Internet freedom and challenging states that repress Internet users (Gustin). While there is an acknowledgement that the Internet can not be splayed from above on countries in order to usher in democracy, health, and prosperity, recent events show that the kind of tools used in digital diplomacy are becoming more relevant. Events in Moldova, what came to be called the Twitter Revolution, saw the youth of the country use social media to protest the national communist party assuming power in the spring of 2009. The ability for protestors to update their fellow citizens and the rest of the world in a play-by-play manner through technology allowed the protestors to gain a platform to voice their discontent (Moldova’s Twitter Revolution). This is significant because it is the first instance where usage of social media combined with national political protest occurred on the world stage. This was followed by the actions of the Chinese state in response to the Uighar uprising later in 2009, where China shut down the Internet in certain areas in order to control the spread of information and to disrupt those protesting. Chinese media tried to report the ‘official’ story of the unrest by placing the blame on the Uighers, an ethnic minority group in the area of Xinjiang, where the violence took place. Despite the censoring of information emanating from the region and the suppression of mobile phone services, sporadic news accounts from citizens made it on to the Internet (AFP). The final validation in 2009 of the work being pursued by Ross and the State Department was the uprising in Iran following a presidential election. The Western world relied on social media such as YouTube and Twitter to learn of events in the country. In fact, one of Ross’s colleagues at the State Department commented that the video uploaded to the video hosting service YouTube, which showed the death of a female Iranian activist was “the most significant viral video of our lifetimes” (Lichtenstein). Much of the intelligence gathered by the United States came from social media because the content was being produced by Iranians themselves. However, the Iranian example also provided a moment for controversy, as the extent of measures the State Department could and should take to intervene were ill-defined. When one of the opposition movements leaders in Iran notified the State Department’s technology staffers about the impending shut down of Twitter for regular maintenance, the State Department reached out directly to the CEO of Twitter and asked that the service time to be postponed. This intervention of the State Department in the affairs of a private company as well as the implications this decision had on the Iranian protests raised concern from observers. Questions were asked about the extent the United States would go to support movements that are adversarial to the governments of sovereign nations, especially after President Obama had said the United States would not interfere in Iran’s elections (Lichtenstein). As the United States refines its policies and actions on promoting freedom abroad through the usage of the Internet, there has been a shift from funding diaspora and dissident groups residing outside their countries towards providing the technology to communicate to the citizens on the ground in the target country (Lichtenstein). As a report published by the Center for a New American Security illustrates, the United States is pursuing five different strategies to promote Internet Freedom. These strategies are not as well publicized as the efforts of Ross and his digital diplomacy team, but they could have an equal or more significant value to American foreign policy in the long term. The first strategy is that of providing Internet technologies to dissidents and internally suppressed movements. This includes a variety of circumvention technologies to allow users to use the Internet anonymously, it also includes technology to allow for their websites and databases to survive a denial of service attack, as well as security in the form of a ‘panic button’ that would wipe digital information databases that could contain information on fellow dissidents. The need for this technology is most acute in societies where the government actively tracks and combats their citizens in the cyber domain. The reasoning for US government intervention rather than the private sector stems from the desire for citizens to access the Internet without leaving a trail of their identity along the way. Because private corporations enter markets to sell their products, the desirability to have no record of their usage would clash with the need to charge users for services (CNAS). Secondly, using what international relations theorists term the second face of power, that of norm setting, United States could use this technique to encourage Internet usage and freedoms. While a part of a longer term strategy than some of the others discussed, the United States has argued that the terms of Internet Freedom are already found in the Universal Declaration of Human Rights, where the right to communicate has been asserted and expanded upon and thus the Internet is just another form of communication. Secretary Clinton has called the Internet the world’s 21st Century version of a “town square, classroom, marketplace, coffeehouse, and nightclub” (Clinton). Thus the State Department is trying to frame cyberspace as simply an extension of the analog forms and places of communication that have been the focal points for previous free speech and expression proponents in the past. The United States is also attempting to use the international bodies that meet and debate on information and communication technologies as another forum to shape the agenda. In 2005, the World Summit on the Information Society (WSIS) and in 2008 the International Telecommunications Union (ITU) made declarations that supported the free movement of information and communication in the realms of their policy jurisdiction (CNAS). This type of strategy clashes with some cybersecurity concerns of the United States and the policy implications of this will be expanded upon further in the analysis section. Third, American foreign policy can also benefit from engaging the private sector in order to fulfill their objectives. First, the State Department and American public diplomacy organs will have to combat the image that American companies help support repressive governments through the selling of hardware and software to regimes that do not support the openness of digital expression that WSIS and the ITU call for. American companies such as Cisco, Google, and YAHOO! have been involved in high profile stories about their engagement with China and their repressive Internet policies represented by the Great Firewall of China. Balancing the amount of engagement versus the desire to cut off repressive regimes from advanced technology will need to be emphasized as American foreign policy on the Internet is developed (CNAS). Fourth, the US government must stress the economic benefits of a more connected populace. CNAS says that this must be conducted in three different ways: persuasion, publicity and trade agreements. By persuading governments that the added benefits of a more open cyberspace can reduce their costs through the decrease in corruption as well as added investment opprotunities, the United States can show how less restrictions on the movement of information can help spur the economy of the country. The United States would have to back up this argument by placing restrictions on US investment in those countries with repressive digital regimes, or by convincing the private sector that doing business in that type of political environment is dangerous for their employees and for their brand. The example of Google pulling out of China despite the financial losses can be held as the example the United States can pitch to other sectors of the economy. If an American company still insists on engagement, the United States government can hold hearings or pass legislation that would publicly name and shame those companies that continue to do business with autocratic regimes around the world. Through the trade policy, the United States can insert language that would treat the inhibiting of Internet usage as a non-tariff trade barrier and thus allow the United States or their cyberspace allies to bring the matter to an organ such as the World Trade Organization in order to resolve the dispute. This would widen the scope of interested parties in Internet freedom and could bring more pressure to bear on the offending country (CNAS). Finally, the coordination with the Departments of Commerce and Treasury can allow the export of technologies that the State Department is attempting to proliferate under their first strategy. The ability to allow the private sector to import technologies such as basic mass market electronics as well as the sharing of open source code software will allow the populace in regimes such as Iran, Sudan, Syria, and Cuba to use these technologies in the furthering of movements that support democratic reform (CNAS). Currently trade policy is not lined up perfectly with foreign policy and in cases like open source software, Internet protocol addresses that originate from countries on a no-trade list are unable to download that software. Inside the State Department, Internet policy is headed by the NetFreedom Task Force which coordinates the government’s Internet freedom. According to the Congressional Research Service, the actions taken by the NetFreedom Task Force line up with whatCNAS had observed previously and suggested for the future. The Task Force monitors Internet freedom and publishes its findings in the annual Country Reports on Human Rights Practices, specifically on the quality of cyberfreedom in each country. Additionally, it engages in multiple forums that support Internet freedom and expands access to the Internet by providing technical and financial support in the developing world (Figiola). The power of the Internet on changing governments and societies is highly contested in academia. The opposing sides are those that support the theory of technological determinism versus the camp of social constructivists. 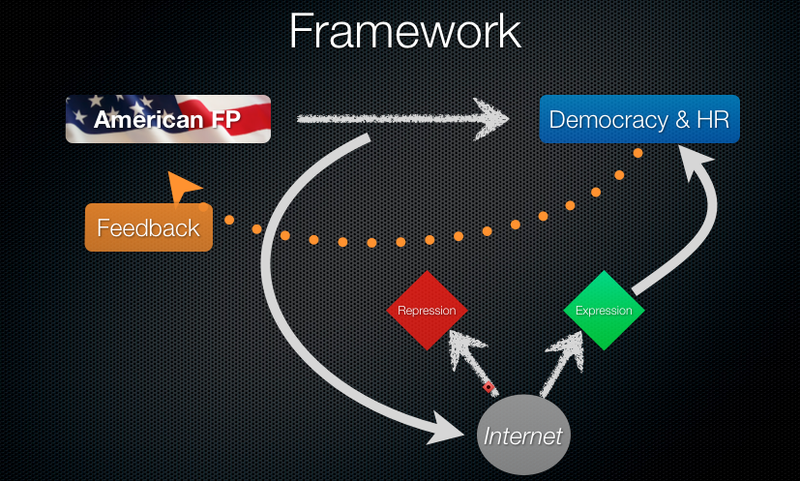 These frameworks lead into the debate about whether the Internet is a tool for repression or expression. To understand the power of the Internet and how it can be used by American foreign policy, an examination of these four ideas is necessary. A literature review will illuminate these opinions and show how American foreign policy fits the power of the Internet. While a whole paper could be dedicated to what the Internet is and the causes it has on society, a simple explanation of what the proliferation of the Internet means for development and democracy is all that is possible to be covered in this paper. The literature on this has generally regarded the spread of information and the development, diffusion, and usage of ICTs through a nation as the next stage of development which increases prosperity (Madon; Castells). The engine of the economy has come to be information and knowledge, which can transform productions or structures into new forms of management and organization (Madon). Development not only occurs in an economic sense, as a 14-year old report showed even as early as 1997 that a positive correlation between the ranking in the UNDP Human Development Index and the number of Internet hosts in the country exists (Press). Thus the Internet is not just a driver of economic growth, but a progression of social uplifting as well. Socio-economic development is seen as a focus of ICTs because of the way technology is seen as a gap narrower. While economies must still harness opportunities presented by technology, catching up to developed economies and achieving similar economic benefits is more possible than ever before (Hameed). As discussed above, with the world economy turning into one of an Information Society, the playing field is leveled to an extent because natural endowment of resources or demographics is no longer the capital on which economies rise and fall. However, the advantages that developing nations held in terms of comparative labor costs are also diminishing as the application of knowledge is becoming the new realm of competition in an economy. While the brain drain is an important facet to consider in a national economic policy, developing countries should take solace in the fact that even if they lack traditional forms of economic hard power, the ability to create resources through the spread of technology and education is less of a barrier than ever before (Hameed). The example of Estonia becoming a hub for technological development or Nairobi becoming a central hub for mobile application development in Africa stand out as two prominent examples of countries creating economic policies that raised their level of development to greater heights in those areas than some of the traditional economic powers in the world. In terms of democracy itself, the Internet is a facilitator of two-way political communication. The system of democracy is based on the political power that individuals acquire by competing for people’s vote, and thus the more availability of information to make their choice the harder politicians must compete (Schumpter). Two-way communication has the ability to increase citizen participation, increase human understanding, and enable a collective intelligence because of this sharing of information (Su-Lien & Barnett). These studies of two-way communication began with the telegraph and telephone and as the magnitude and diffusion of ICTs has continued to grow since the time of Alexander Graham Bell, so too has the impact on society grown. Undoubtedly, the impact of the Internet will continue to grow as it evolves and becomes common place in society worldwide. As human rights have become interconnected with the freedoms that people enjoy, the usage of the Internet to increase the rights of people must be considered as well. Information that is timely and accurate greatly supports the promotion of human rights and thus organizations that conduct these activities, such as Amnesty International and Human Rights Watch, need to process information from as many sources as possible in order to present a conclusive picture of the status of human rights in countries around the globe (Brophy and Halpin 352). The ability for people to mobilize cheaper, to spread information quickly through networks, to form large but decentralize coalitions, and to empower NGOs through the reduction of the monopoly on information are all ways that ICTs aid the expansion of human rights in the world (Brophy and Halpin 353). Academic theories of democracy caused by the Internet have been put forth in the same tradition of those exploring the effects of the printing press on European religion and politics. Exploring the theories about the effects the Internet has on democracy are important to understand because they can provide a guiding light for American foreign policymakers in suggesting what paths would be most fruitful. The most popular theory resides on the idea of the Dictator’s Dilemma. First put forth by Christopher Kedzie in his study of the Soviet Union and its transition, the idea is founded on the presumed ability of globalization and globalized markets to persuade repressive governments to open up their borders to trade and communications flows. The flow of information is presumed by Kedzie to bring in ‘democratic’ information. The dilemma stems from the fact that if a dictator was to completely cut off his society and sever this democratic flow of information, his economy would suffer to such a large extent because of the increased commercial connectedness of the world. However, once the gates of information are ajar, domestic resistance can foster by exposing government abuses to the outside world. Due to the lowering cost of ICTs and Internet subscriptions, increasingly more people will be able to access this democratic flow of information and also be able to contribute to it. The citizens will also gain a view of other nations and how their democratic structures have enabled higher standards of living, thus causing resistance to the authoritarian ruler to increase. Kedzie says this is the domino effect of liberalizing information flows and that Dictators cannot resist this indefinitely as cutting off the world’s markets would inevitably lead to an economic collapse due to the effects of autarky (Best & Wade). The second theory that supports the Internet as causer of democracy is that increasing connectedness through the Internet amplifies the preexisting trends in international affairs. Steele and Stein, who present this argument, approach the Internet as a neutral ‘constant’. The political trends over the past 40 years have seen an increase in democracy and the Internet has helped the power of the United States and European Union proliferate their policy preferences. However, they do contend that in a brutal regime, the power of the regime is amplified as well. This would contrast with the third theory, which states that the Internet is inherently democratic because it allows people an ability to consume and gather information on a scale and with an ease that has never been possible before. The backers of this idea, Rosenau and Johnson, reinforce the idea of Castells about the increase in information and development that it leads to. Thus the ability to make better political choices is available to those connected to the Internet. On an international level, these scholars say that the Internet has led to the increase in the amount of voices that can be heard and thus have allowed more stakeholders to gain power in the international system. NGOs would seem to be the main beneficiaries as they are able to use the Internet to appeal to a worldwide constituency in order to gain membership and support (Best and Wade). Finally, the idea that capitalism embodies democratic ideals is one that might not resonate due to the recent financial crisis, but the ability to grow one’s domestic information capital reserve might be the way many states grow their way out of the recent downturn. If a new Kondratiev wave is on the horizon, undoubtedly countries that have the most labor skilled in information technology will be among the first to benefit from this next technological era. Thus because the world market will be competing for labor that is specialized in information systems, democracy will have to grow due to the characteristics of this new labor force. The scholar behind this idea, Frank Webster, says that this new labor force, which he calls symbolic analysts, are constantly learning workers and favor meritocratic systems because of the high level of education they have received. They wish to see the benefits of their studies be rewarded with a higher standard of living and more political rights. If these symbolic analysts do not receive this compensation in their home nation, they will move to a country where these rights do exist. The Internet plays its part because of the furthering of linkage between the economy and the Internet. Those who understand the Internet and the ways to use new technology will be most coveted by domestic economies and thus those governments or regimes that wish to grow their economy will have to pander to this new and growing labor force in order to attract them (Best & Wade). These arguments are combated by those who see the Internet as a tool for repression and one that will actually strengthen those autocratic regimes that use it to their corrupt benefit. Thus democracy will be stifled, not encouraged, by the Internet. The major suppression theory of recent scholarship says that the Internet will be used by the ruling class of a state to enforce the political, social, and economic structure that best suits the elite. The most prominent defenders of this idea, Shanti Kalathil and Tyler Boas, provide empirical evidence that supports their theory. They draw on case studies of China, Cuba, Singapore, Vietnam, Burma, the United Arab Emirates, Saudi Arabia, and Egypt to assert their case. Additionally, others have argued that through strategic coordination, authoritarian rulers have lessened the link between economic development and liberal democracy in order to stifle the bottom-up potential of Internet, while still using it to promote growth (Bueno de Mesquita & Downs). This would seem to contradict Kedzie’s dictator dilemma and shows that autocrats and their regimes have been able to adapt to the initial shock treatment that the Internet had on repression and now are able to use it as a tool for their own benefits. While the Internet is by its nature an incubator for new possibilities in sending and receiving information as well as an information barrier breaker, empirical support for the linkage between democracy and Internet diffusion would substantially help the massive array of qualitative data that exists in the field. Best and Wade put forth an examination of the previous theories as the theoretical framework for their empirical analysis of the Internet as a catalyst for democracy. Their results find that the Internet-democracy correlation occurs late in their timeline, occurring just after the turn of the millennium. They find that the Internet is a better fit in terms of predicting democracy than other socio-economic statistics such as literacy. They hypothesize that the correlation is seen later in their timeline because Internet penetration is just starting to ramp up. While they do not claim that the Internet itself is a natural facilitator of democracy, their findings suggest that Internet usage does have a positive relationship on democratic growth. However, Jacob Groshek puts forth a recent times-series analysis spanning multiple countries that asks this critical question. He finds that simply increasing the diffusion of the Internet does not lead to increased democratization. This should not discourage the promotion of the Internet penetration, but simply reinforces the views of social constructivists who do not see technology on its own impacting society, but how that technology is used by humans will determine the effects. This should give greater credence to the efforts of the US State Department as Internet penetration alone will not lead to the successful objectives of spreading democracy and human rights, it is the programs and efforts to link technology with traditional forms of democratization. The Internet is still a force to disrupt the obstacles of communication and empower new political strategies (Brown). The technologies associated with mobile computing and communication are not the drivers, but the tools “for economic growth, political expression and social change” (Ross). While the technological determinism camp is generally rejected by those promoting the usage of the Internet today, there is still the debate on the effects of the Internet and democracy and how people can positively or negatively affect democracy by using ICTs. Due to the fact that the Internet can be used for repression of expression, there is a need to formulate policies that encourage ICTs’ usage in the latter. These freedoms will be run through my framework which is set to analyze whether these freedoms will actually help turn the Internet dial from repression to expression and thus perpetuated freedom and human rights, which are the aims of US foreign policy. This framework accepts that despite evidence that the Internet by itself may be a crusader for democratic ideas in the past, the current geopolitical situation suggests that authoritarian states have ‘figured out’ the Internet and are now able to use it as they see fit. Thus American foreign policy should be directed at making the Internet a force for democracy despite the best efforts to counter this by repressive regimes. This is a finely balanced engagement, and while the battlefield is seemingly even, the winner will be the actor who understands the nature of the battlefield, in this case the Internet, to the greatest extent. The victor will use the most appropriate tactics and tools for the task at hand. While it would seem to be an inevitable victory for those seeking free expression and democracy in the long run, the ability of repressive governments to quickly learn how to utilize new technologies should not be underestimated. To ascertain how the current US foreign policy is aligned to turn the dial of Internet’s effects on freedom, the two freedoms that are most aimed at publicly will be considered: freedom of speech and freedom to connect. These two are chosen to be under examination because they are directly referenced in the usage areas outline in the NSS. First, there must be a brief explanation on why these freedoms can lead to democratic governance. The linkages of freedom of speech and traditional democracy are often said to be best articulated by the Alexander Meiklejohn, a former Brown University administrator in the early 20th century. His argument that for a system of self-government to work, the electorate must be properly knowledgable and that there can be no constraints on the flow of ideas and information. If criticism is muffled and information is monopolized by those in power, democracy cannot reach its full form (Meiklejohn). By promoting the usage of the Internet through funding and training the US State Department is making a tepid step into the promotion of the freedom of speech. The stated policy that the United States does not engage in regime change handcuffs possible overt policies that could aid democratic movements around the world. Thus, if the United States was to become more active in the promotion of this freedom, it would require a covert strategy to get technology in the form of hardware and software into the hands of pro-democracy movements. Additionally, the State Department will have to engage those American technology companies operating in countries with regimes that are not conducive to a free and open society to coordinate any policy. Again, the best way to do this would be covertly, and thus not available for analysis by the public or academia. However, even if the United States was acting fully on a overt and covert level, would the proliferation of technology be enough to combat the repressive usages of the regime’s own Internet security? The answer is a qualified affirmative, based on a few conditions. The United States would have to make sure that the hardware and software was properly aligned for the pro-democracy population’s needs and the political conditions on the ground. Perhaps all that is needed are the tools for economic empowerment and a tipping point will be reached where a political transition happens very smoothly. However, other regions may call for the support of technology that allows a more aggressive pro-democracy campaign to take place. If the movement is up against a regime that is able to flip the Internet switch off and on, the State Department needs to arm them will technologies that can circumvent the land based infrastructure and broadcast a connection wirelessly to the country. Whether that’s with mobile hotspots that can project a wireless Internet connection, or satellite uplinks, the need to spread these technologies before the government is aware of the usage of the Internet to attack their regime will be key (Adhikari). However, if the United States is able to penetrate technology that allows protestors to mobilize covertly, it can greatly increase the chances the movement can succeed, or at the very least gain international recognition as happened in Moldova. However, the case of Moldova served as a warning to repressive regimes, and now the usage of mobile phones will be the first thing targeted by governments attempting to stay in power. Thus the State Department will have to stay ahead by providing a technology that does not rely on state-owned telecommunications infrastructure. The second qualification stems from the cybersecurity strategies that the US government puts forth for national security. These policies often conflict with freedom of the Internet and thus call into question the real motives of American foreign policy. If diplomats are espousing the benefits of the Internet abroad, but domestic policy is restricting usage, a hypocritical message is distributed. Thus properly explaining American defensive security measures on the Internet is needed before the US can be seen as a pure champion of freedom of speech abroad. Secondly, the ability to connect does not just extend to the protestors that was discussed above and the human rights benefits earlier in the paper. The ability to connect also means setting the infrastructure for people to interact, aid, and collaborate across borders. The SMS system that was set up to enable contributions to the Red Cross for relief efforts in Haiti was created by Ross and saw an unprecedented amount of individuals donate in an almost instantaneously manner (The Diplomat). Allowing for cross national interaction plays a part in Kedzie’s Dictator’s Dilemma. As a nation is able to learn about the economic benefits enjoyed in freer societies, agitators who desire the same thing will emerge. Thus the need for North Korea to maintain a powerful internal propaganda and monitoring system to restrict the flow of external information is critical for that regime’s survival. Is this enough to spur democratic change and an increase in human rights? The methods described in this paper often occur at a level that is based on the new desire to spur people to people communication. That can be seen in the virtual embassies that the State Department has set up for countries where there is no official American diplomatic presence such as Iran and Somalia (RFE/RL). However, the ability to connect is based on the infrastructure as well. The United States needs to focus on the creation and funding of broadband Internet in order to continue its digital diplomacy. While the United States can produce a excellent website, YouTube clip, or photo stream, if the Internet connection or the Internet terminal does not support that medium due to lack of uplink/downlink stream of the incompatibility of the media, the messages the United States creates are useless. While, using microblogging sites is an excellent short term solution, nuanced policy needs a more advanced method of engagement. The restriction to 140 characters to explain policy or extol American values will only resonate with those people who have mastered the medium because of their ability to connect. What of those rural farmers in China, or the urban poor in central Africa? The ability to connect will rely on the infrastructure reaching them first before any engagement can take place. Concentrating on programs that expand third generation telecommunication technology or subsidize broadband Internet for a wide range of subscribers will be a significant long term goal the United States can undertake to expand the reach of their digital messages. Overall, the United States has made significant strides in formulating its national policy on the use of the new mediums that the Internet provides. Continual evolution of policy and strategy is evident from the stream of current news stories about the topic. Just recently, the launch of the virtual embassy for Iran caused a massive amount of news coverage on the topic. This shows that the United States is attempting to live up to the strategy outlined in the NSS in order to promote the US’s support of democracy and human rights abroad. However, the ability of the Iranian government to turn off access to the site is a challenge the State Department will have to address if not to waste their efforts to engage in digital public diplomacy with Iranians. This paper set out to ascertain how the Internet fit into American foreign policy and ask whether its usage could help achieve American policy objectives. The examples above paint a broad overview of American engagement in cyberspace as well as the theoretical arguments that discuss how the Internet plays its part in expanding the freedom of expression or facilitating government repression. My framework looked at two of the five Internet freedoms that the US State Department aims to promote and protect and ran these through a framework that suggested US foreign policy should be aimed at stopping any attempts to use the Internet as a tool for repression and thus push the pendulum towards the uses of pro-democracy movements. The framework found that the current strategies used by the United States were aimed in the right direction, however they needed to be expanded or localized in order to see quicker results. Their opponents in this framework have used repression technology very openly as part of their regime structure. This paper showed what it would cost the regimes if they faltered in their attempts. However, as time goes on, their abilities and knowledge on how to use the Internet as a tool for repression increase. Thus, it may require the United States to up their engagement in digital diplomacy to head off this repression and to succeed in the promotion of democracy and human rights abroad.